Welcome to the official website of York Cemetery. This is the place to find out about all of the cemetery’s business and social activities. 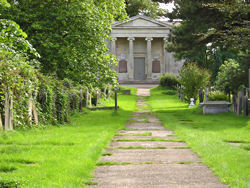 York Cemetery is a grade II* listed landscape and is one of only two privately owned Victorian cemeteries in the UK. Founded in 1837, it now encompasses 24 acres and is administered by The York Cemetery Trust with support of the Friends of York Cemetery. York Cemetery is a working burial ground. At the same time, it provides opportunities for conservation, education, and informal recreation within a protected environment close to York city centre. Trustees, staff, Friends, and volunteers all work to achieve the right balance between the provision of a community facility and support for the environment. If your particular interest is genealogy and family history, you will want to visit the companion website, www.yorkcemeterygenealogy.co.uk. A knowledgeable and enthusiastic group of specialist volunteers maintain the website, which concentrates on this important aspect of York Cemetery. On site parking in the cemetery may be restricted from Monday to Friday when funerals are in progress. There is limited parking for families and Blue Badge holders. Alternatively, there is a pay & display car park in nearby Kent Street. Any remaining advent wreaths on graves will be removed by the York Cemetery Trust from Monday 4th February. Your cooperation is appreciated,. Ground floor room available (4.5 x 3.4m) with its own phone line and desk, shared access with other tenants. Call the Cemetery Manager (Wendy) on 01904 610578 to arrange a viewing. The Friends of York Cemetery was delighted to receive a Gold Award for the second year running, this time in the Parks, Gardens & Cemeteries Category of the RHS Yorkshire in Bloom Competition 2018. “The cemetery has over 60 volunteers and 4 full-time staff. Funds are raised through donations, events and walks which take place throughout the year. There is so much history connected to this wonderful cemetery. The judges were particularly impressed by the way that little gems had been uncovered, preserved and developed around the cemetery – Rock Garden, Lime Avenue, Victorian Fernery and Herb Garden, as well as adding areas such as orchards and bee hives, and masses of bulb planting in the entrance and surrounding areas.